So Happy To Announce My Partnership With Tom’s Of Maine! A few months back I was approached by a representative from Tom’s Of Maine. You don’t need me to tell you who Tom’s Of Maine is, right? This is a pioneering, well-established, and prominent brand in the natural living community. And they asked me to be a part of a year-long collaboration called the Goodness Circle – as a sort of “ambassador” for the brand. I’ll admit, I was nervous. This is the first time I have ever directly partnered with a large company, and certainly the first time that I’ve been financially compensated for doing so (and yes, full disclosure, I am being compensated for my participation in the program). So, as I’m sure it goes without saying, this had me feeling slightly apprehensive. I mean, what would be expected of me? And would I be compromising my integrity in the eyes of my readers? Okay, so maybe I was being a little bit silly. (Tendency to totally over-think things? Check!) Because honestly? All my reservations were resolved within the first few minutes of the first Goodness Circle conference call. And I am SO happy to be a part of this team! I was raised by hippies in a certified-crunchy household, which meant I grew up using Tom’s products. So I was familiar with the brand insomuch as I knew they were all-natural, and were pioneers in that field. 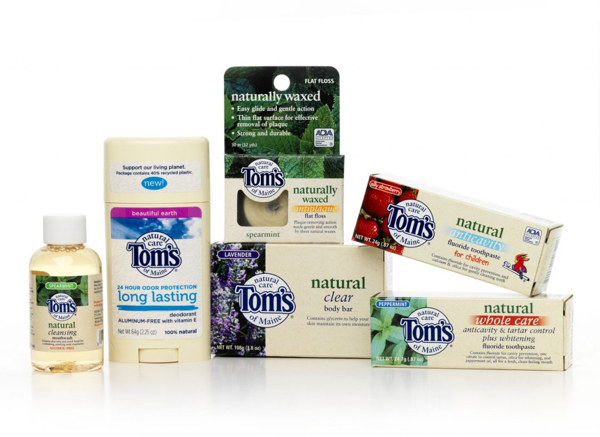 Because of this, Tom’s is one of the most widely available natural + eco-friendly + cruelty-free brands around. And that was the main reason I decided to accept this partnership. I love that Tom’s means access. Tom’s is in Trader Joe’s, in regular grocery stores, and in drug stores. Tom’s means that almost anyone, almost anywhere, can choose a safer and more wholesome product for their family. What I didn’t know going into this, and what I quickly learned in that first conference call, is that Tom’s is a company that’s completely centered around social responsibility and community building. For example, 10% of ALL profits are donated to charity, every year. I couldn’t believe that! As well, every Tom’s employee is encouraged to take 5% of their paid work time to go volunteer with the organization of their choice. That’s to say, they will go work somewhere else, and Tom’s will pay them as though they were working at Tom’s. 5% of their hours, every year. Dudes. That’s incredible! You can learn more about their charity and community outreach programs, here. I have been completely impressed with this company, and the more I learn, the more I love them. Yes, no company is perfect. But that’s okay, because neither am I. What I really appreciate is Toms’ openness to hearing from their customers, and making changes. I look forward to sharing my ideas (and YOUR ideas) with them over the next year (and have, in fact, already begun to do so). I am excited to see what will grow out of this partnership. And now I want to ask you – what would you like to see? 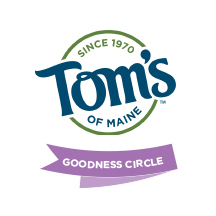 Do you use Tom’s Of Maine products? Y’all are conscientious, informed, inspiring eco-warriors. I’d love to hear from you! We use the Tom’s childrens toothpaste. I like that they have both with flouride and flouride-free so each parent can make theat choice. I don’t like the use of Caraageenan. But I just try to make sure none of it is injested. Is it possible within your remit to see ‘behind the scenes’ of a company? That would be cool – it would be good to see how they do their testing, how they come up with their natural products (whatever natural means!) and stuff like that. I do use Tom’s when I come across it, primarily the deodorant and mouth-wash, although I’m in the UK, so its availability is limited to more health food shops and the like! Best of luck with the collaboration, Sayward! I’ve used Tom’s products quite a lot, so it is nice to know more about them, thanks for posting! Congratulations! That must be exciting! I love their products but no longer use them because of their parent company, colgate-Palmolive. We used to use Tom’s when it was an independent company. Now, because any profits go to Colgate with their horrible environmental and animal-testing practices, my family avods them like the plague. Here are 2 interesting articles on the sell out (literal) of Tom’s. I must say, it does make me uncomfortable that they’re now owned by Colgate. I do still buy Tom’s toothpaste – it’s still one of the least bad options (and reasonable compromise of natural properties with effectiveness), but I wish I knew of a comparable product that was still produced by an independent company. If you’re able to do so within your partnership arrangement, I’d be interested to hear your viewpoint on using natural products that are owned by larger conglomerates, the trade-off of being associated with less-than-ok products/companies to be more widely available, etc. Would you be able to share how, if at all, they’ve changed since being acquired, and if the great practices of Tom’s have rubbed off at all on other now-related companies? So happy for you! I was one of the folks encouraging you to do this! I think I used a different username off my old email, but I had told you when you’re 60 or so, you don’t want any regrets about what you could have done to improve your financial situation (yes, I have them!). Yes, I still stand by my opinion that this is an imperfect world, and we just do the best we can…that’s why I call myself plant-based and not vegan, because I do consume some unfortunate by-products. But I don’t beat myself up and just try my best. If I were to look into the background of some mega corporations, I would probably end up living on air and water! You are absolutely beautiful and will make a wonderful spokesperson! Congratulations! p.s. I’ve used Tom’s of Maine for years. Love their toothpaste. The only reason i don’t use Tom’s is that i need to use toothpaste for sensitive teeth. (talk about putting chemicals in your mouth….but going without it is torture.) If they could make a sensitive teeth fennel toothpaste, well, that would be heavenly. Leaping Bunny solely indicates that the product has not used animal testing. It is not a vegan label. I didn’t know Tom’s was so socially, as well as economically responsible! very cool. On the back of the toothpaste box and on the Tom’s website for that toothpaste, under the Leaping Bunny symbol it says “no animal testing or animal ingredients”. Just curious why it’s advertised as such. so happy about your partnership with toms! i remember your post when you shared your concerns about the company. i understood the apprehension, but they are a great company doing great things, and i am a loyal customer of their aluminum free deodorant and fluoride free toothpaste. What about Weleda? That’s a wondeful company to support! The pink toothpaste & calendula toothpaste are very good. I make homemade toothpaste because I can’t find anything that makes my teeth feel as clean. The kids don’t like it so I either get them fluoride-free Tom’s or Redmond Earthpaste. Besides the fact that they are owned by a company that does testing on animals now, THIS. Sorry, I was going to read your blog, but now that you are sponsored and funded by this company of lies, I am forced to ignore it, and all that you write. Leaping bunny has become a joke. Half their listed items have the ‘purple’ cube next to them, and it’s misleading. the purple ‘cube’ means that those companies are owned by animal testing giants like L’oreal and Revlon, or P&G. Pet’s list is not up to date either. It seems there is no perfect pure list to be found anywhere, and leaping bunny’s is the most correct, but also the most misleading if people are not aware of the purple cube factor. which most are not.